Newest Blackmagic Micro Cinema Camera Formfitting Cage Want To Share With U Guys! This is a cage for Blackmagic Micro Cinema Camera/ Blackmagic Micro Studio Camera. The cage is made from the high quality aluminum, so the cage is lightweight and it can matched to your camera perfectly. With two screws on the bottom to mount camera and make the camera stable when you're shooting. There is a NATO-style side rail and two cold shoe mounts which can mount more accessories. Besides. 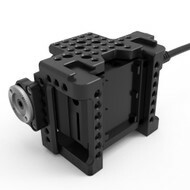 It is call SMALLRIG Blackmagic Micro Cinema Camera Cage. Very happy to share with you for info.